If you drank as much coffee as I do, you'd begin to appreciate my fascination with all things having to do with the Noble Bean. 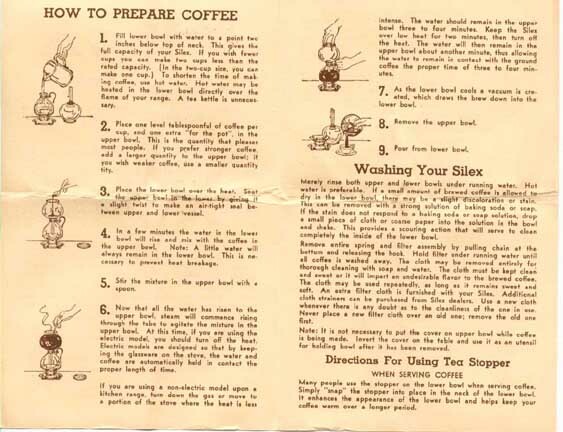 This page is all about the mechanics of brewing coffee, particularly those very bizarre and complicated Vacuum Systems that were all the rage in the 1930s. 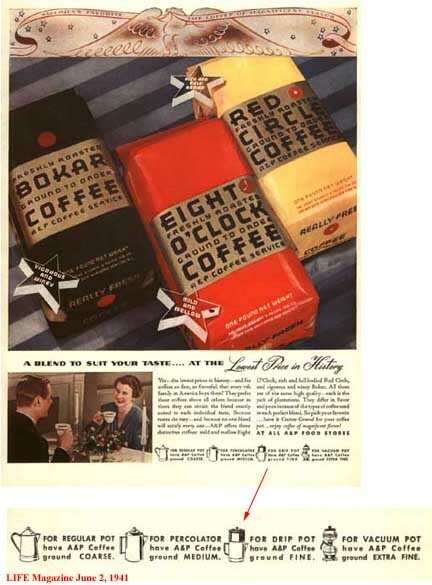 Note that back in 1941, the A&P markets -- now "Fresh Fields" -- were very aware of all the possibilities for coffee brewing. At that time the "Regular Pot" meant "boiled coffee". The Eagle is saying "America's favorite...The Coffee of Magnificent Flavor"
That said, let's investigate some of the complex schemes that have been used to brew coffee. As I have hinted, the correct method of brewing is labor intensive: you have to heat the water to the proper temperature and infuse it with the ground beans. The brew must be collected into a server for delivery to the ultimate consumer. So, the three major factors in coffee technology are heating, infusion and serving. All of the technology centers around "labor" from each function. The simplest possible way to brew coffee is to boil it. All you do is put the ground beans into a pot with water, put heat underneath it and let the water boil. After you turn the heat off, you are left with a sludgy mixture of grounds and coffee that has to be strained. If you use a sauce pan, you can strain the grounds using cheesecloth. 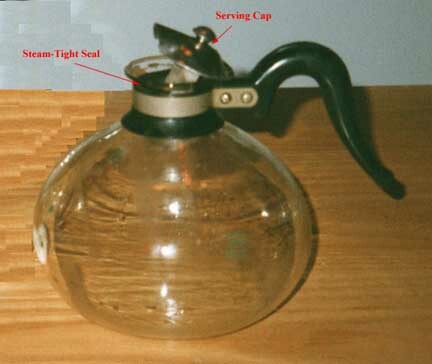 The typical "coffee pot" has a strainer built into the pour spout. Note that heating, infusion and serving are integrated in one place. 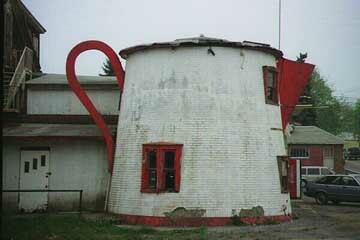 The economics of mass production eliminated the fanciful shapes and eventually led to the truncated cone shape that is easily recognized as a "coffee pot" the world over. Boiling Coffee is most often associated with Cowboys on the Trail. When I was at the Marlboro Party Ranch, some of the "old ranch-hands" allowed me to use a historic trail pot to brew coffee. 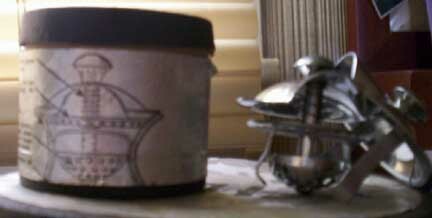 Shown below, it is made of spatterware and uses about a pound of coffee to make a full pot. After you have been riding for a whole day, this stuff doesn't taste too bad. But, there are two tricks: (1) you have to watch the pot very carefully to take it off the fire as soon as the water starts to boil and (2) you should toss a few eggshells into the grounds. The former is to minimize the effects of the temperature exceeding 202 degrees. The eggshells have a very thin membrane that helps congeal or "clear" the grounds and makes them easier to strain. 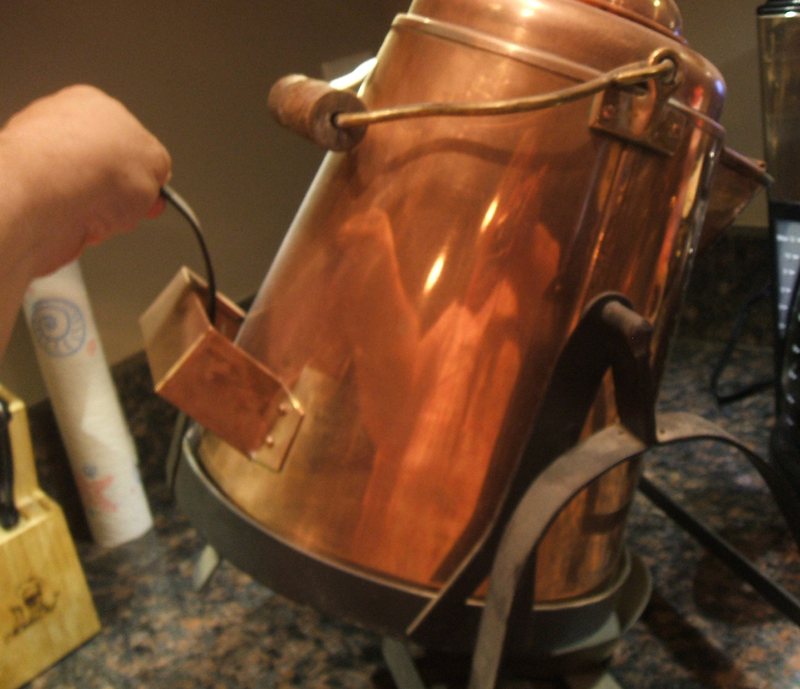 Here are photos a copper coffee boiler/server that were sent to us by our reader Lori. This elevates boiled coffee to a high plane! "...I like boiled coffee the best. However, I don't associate boiled coffee with camping---I associate it with Poland. 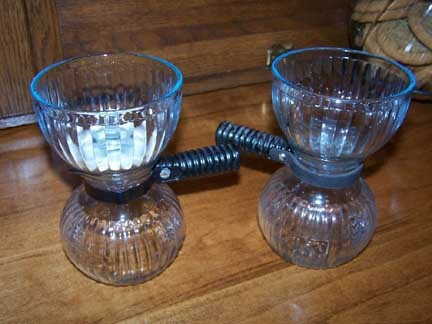 Coffee was traditionally served in glasses. A tablespoon of coffee was stirred into water that is just slightly cooler than boiling. The mixture is then allowed to brew a few minutes, then vigorously stirred. It's ready to drink when the grounds have settled to the bottom of the glass. It's a matter of taste how far down to the grounds one drinks the brew. I once took my 'podwieczorek'--afternoon coffee and cake--in a nice cafe in Warsaw. The brew was served in a china coffee cup which was somewhere in size between a teacup and a demitasse. The coffee had a heavy consistency, having been prepared by boiling a fine grind, and its thickness was augmented by a generous portion of real cream. A cup of this coffee and one of the fine pastries was enough to keep me walking and sightseeing before a late dinner. Poland experienced an incredible economic boom after the fall of communism in the early 1990s, a boom which resulted in part from a 50-year old pent-up demand for household goods. 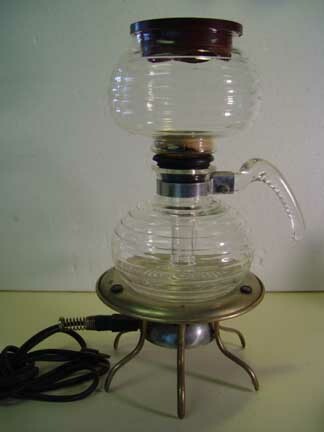 There was a particular mania for the 'ekspres do kawy'--the drip coffeemaker. When I ordered coffee in a restaurant, I always had to ask whether 'kawa ekspresowa' meant coffee from a drip coffeemaker or the Italian-style expresso. 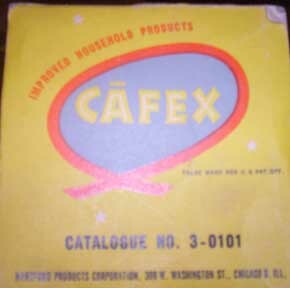 One couldn't get boiled coffee--apparently restauranteurs thought it was declasse. You can also get a very good cup of coffee if you are lucky enough to attend a function at the Polish Embassy in Washington. 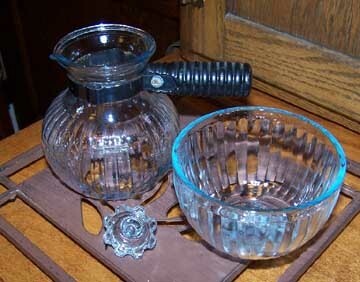 The Embassy would serve coffee from a thermal carafe in demitasses. The brew was perfect--strong, but not bitter. Guests raved about it, and one managed to collar the Embasy chef and find out his secret. He boiled the coffee in quantity and filtered it. 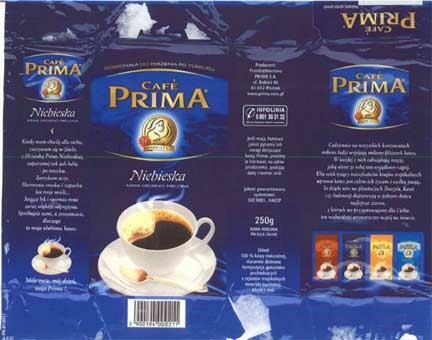 ..."
"Kawa drobno mielona" means "Coffee, Fine Grind"
English: "On all continents, millions of cups of coffee are consumed daily, and this exceptional drink brings magical pleasure to all. For hundreds of thousands of people in tropical countries, coffee is not only a way of life but also a passion. From the plantations of Brazil, Kenya and Indonesia we use beans ripened in the full sun to make this aromatic brew just for you." Coffee for those "Special Times"
English: " In a peaceful moment, I like to curl up in my armchair with a cup of Cafe Prima (Blue) because I like my coffee strong - Turkish Style. I close my eyes and each sip brings relaxation. Try it yourself and you will know why it is my favorite coffee." Tony was right -- this is wonderful stuff for making boiled (Turkish-style) coffee! "... I am allergic to yeast and found that by boiling the coffee as with a percolator, it kills the yeast, and I can drink all I want! So in spite of hearing at WILLIAM SONOMA last Sunday that "Coffee should never be boiled..." ..."
This adds a new dimension to questions about boiling coffee. Soldiers and Cowboys suffered for many years before before an enterprising Illinois farmer named Hanson Goodrich invented the Percolator. 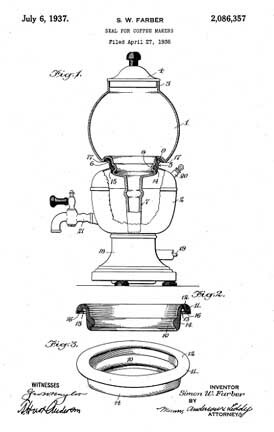 His patent was granted on August 16, 1889 claiming " an attachment that can be arranged in any coffee-pot; it is a slightly covex circular or supporting, or base plate, with a tube rising therefrom, and a cup, secured to the upper end of the tube. 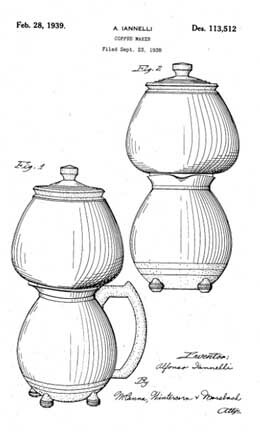 It is so constructed, so that placed within the coffee-pot, the water, when it becomes heated, rises in the tube, escapes into the cup, in which the coffee has been placed, and 'percolates' through the same, as to extract the strength therefrom, finally escaping through the perforated bottom of the cup, to the water below, producing a liquid which will be free of all grounds and impurities so that it is not necessary to use any clearing materials". 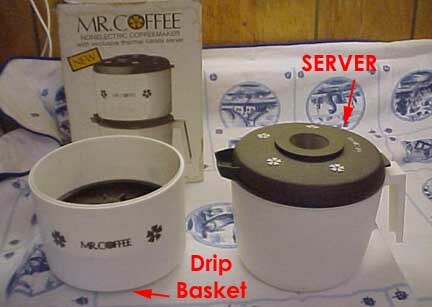 The percolator represents an improvement over boiled coffee because it removes the need to strain the brew; however, as shown below, infused coffee drips down from the percolator basket and mixes with the water to be boiled. Alas, this virtually assures that the temperature of the coffee will exceed 202 degrees. It is virtually impossible to make a decent cup of coffee with a percolator. As discussed above, I would actually prefer to boil coffee rather than use a percolator. 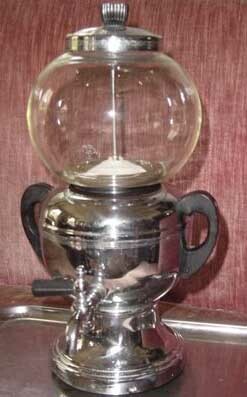 One of our readers sent ust this photo of a very elegant manning-Bowman percolator and its associated cofffee service. 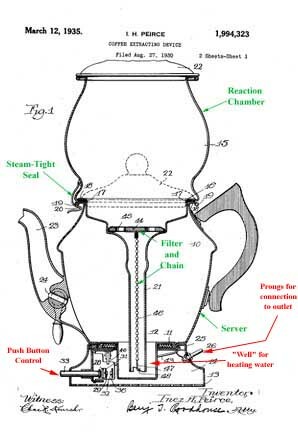 The catalogue number was "382/6" and the stule was called "Geniality" -- based on the serial number (5/35) we infer that this particular percolator was manufactured in May of 1935. 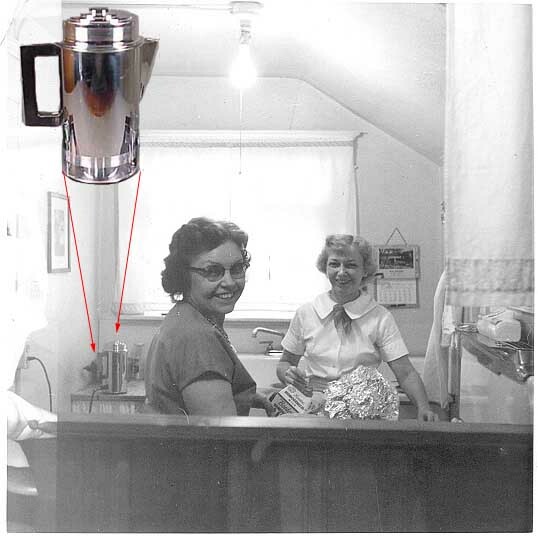 Indeed, the photo taken in the kitchen of Ron's mother shows the percolator in use in the 1950s. Advances in Chemistry and Culinary Science led to a more fundamental understanding of coffee chemistry and the dynamics of brewing. It became clear that the infused brew could not be over-heated without producing very distasteful organic acids. Laboratory techniques for infusion were adapted to home use. The process is quite simple. As shown below, the grounds are placed in a receptacle (the "Drip Basket") that is lined with a filter. Hot water (at the appropriate 202 degree temperature) is poured into the filter chamber and the infused brew drains into the server. Nothing could be simpler. There are a number of variants on the Drip system. 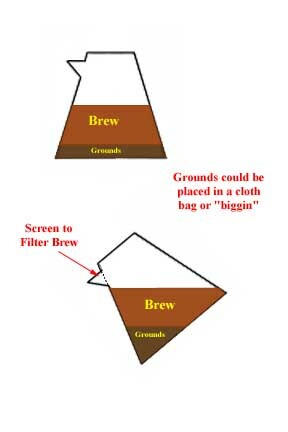 For example, the Chemex system shown below uses a paper filter. 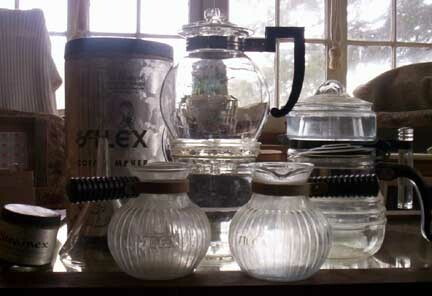 The Chemex system is a symphony of design mixing glass wood and leather; it is on display at the Museum of Modern Art as an example of outstanding product design. 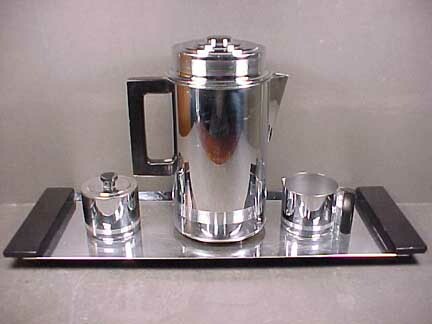 A variety of drip-brewing utensils are available with porous metal filters. Here is a 32 cup drip coffee-maker that uses a whole pound of coffee at a time. 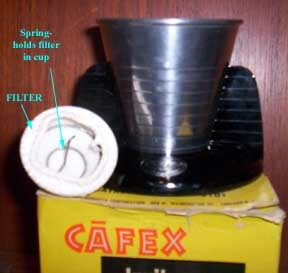 The top portion holds the metal filter and is removed before serving the brew. 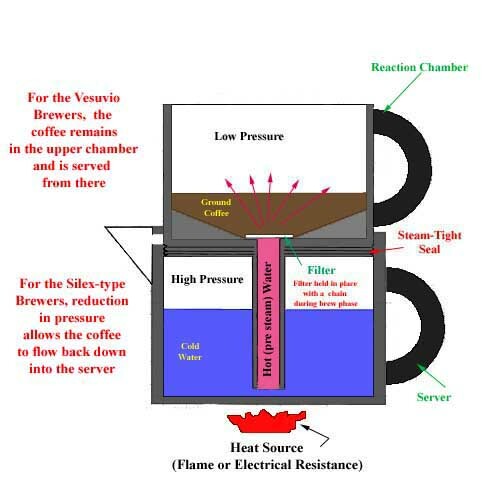 Most contemporary coffee brewers use the drip system and include a mechanism for heating the precise amount of water needed and delivering it to the Drip Basket. This type of brewer began in the 1970s with the emergence of the "Mr. Coffee" brand, as promoted by baseball great Joe Dimaggio. 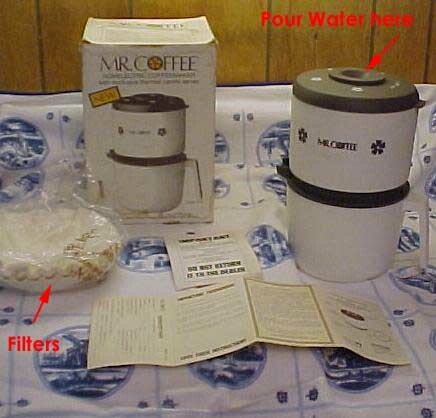 Of all things, one of oour readers sent us in these photos of a very early manual version of the "Mr. Coffee" system. This is just the drip basket and the server, decorated with those everpresent (and obnoxious) flowers-that-look-like-asterisks from the 70s. Thanks a whole bunch to our reader Martha!! Remove the lid and filter assembly. Measure coffee grounds into the coffeemaker. Pour in very hot water . 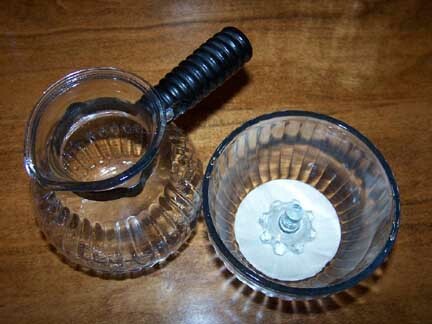 Replace the lid and filter assembly, keeping the filter at the top. Let coffee and water steep together for 2 to 5 minutes, depending on desired strength; the longer they steep, the stronger the coffee. slowly push the plunger down, to filter the coffee. Doing this slowly will keep most of the grounds under the filter of the plunger. Click Here for a much more detailed history of French Filter Press coffee brewing. There have been a number of attempts to create a "one-cup" drip brewing system that might appeal to singles or people who don't drink a lot of coffee. 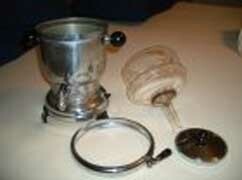 Here is a very early Silex one-cup drip brewer. It used a paper filter weighted down by a glass "knob" or "sprocket" to catch the grounds, hence its "technical term", the grounds-holder). [Thanks very much to our friend Karen for these photos] It is made with the "ribs" that indicate early models, because the technology for forming clear, smooth Pyrex that was break-resistant had not yet evolved. 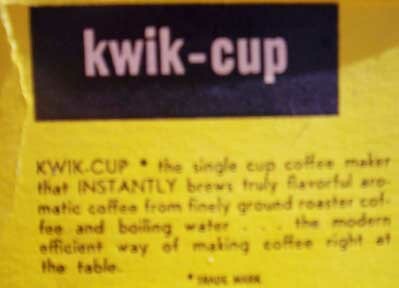 Another of the earliest of these is the "kwik-cup" brewer marketed by the Hartford products Corporation of Chicago, Illinois. Our friend Kim found one of these unused in the original; box in her grandmother's house. I have been through the trademark and patent applications, and I don't think that the "Hartford Products Corporation" ever bothered to apply for a patent or trademark for this thing. My guess is that they threw this together as a "Kwik-Gift" for the Christmas Holiday Season and sold them as stocking stuffers or "arms-length" gifts. I have looked at this up,down and sideways, and it looks like you might be able to brew one cup of coffee with it and then the mess of washing the filter would keep you from ever using it again. PLUS, I don't think that the shape of this brewer is very efficient. "One-Cup" brewers have not had a high rate of success, because the kind of people who might be tempted to brew one cup at a time usually want to drink a lot more coffee than one cup. 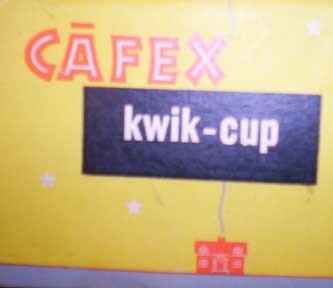 I will be willing to bet that ALL the "kwik-cup" brewers that are out there are unused in their original box! This is, indeed an interesting historical dead end in the world of Drip Brewing Systems. If you really only want to make one cup of coffeee, Melita makes a one-cup brewer, but sells little disposable paper filters for it. Folgers makes a kind of "coffee-bag" version of this in their "Coffee Singles" packages. Of note, they are about the only firm offering this -- the things don't sell well enough for the supermarket chains to offer their own competing "House Brands." As I said, the drip method is my favorite way of making coffee. 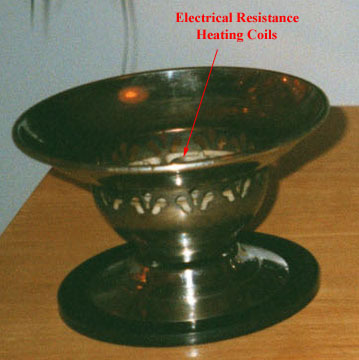 The techniques shown above require an external source of heated water (i.e. 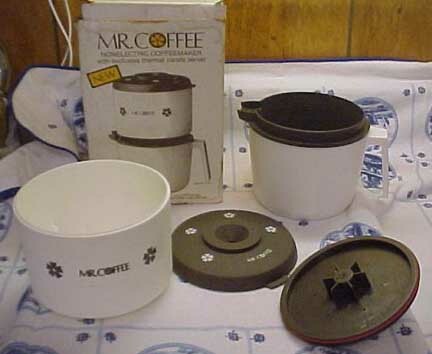 from a kettle...) In the 1980s, the Mr. Coffee appliance was developed to integrate heating with infusion and serving. In that case, a reservoir of water was heated with electrical resistance coils until the proper temperature was reached. Then, the water was discharged into the filter. These devices are quite convenient but it is virtually impossible to clean the tubing through which the hot water is discharged; eventually, calcium sediments will build up and add a bitter taste to the brew. These devices are only good for about six months unless you exclusively use distilled water. The vacuum brewer has three parts: a server, a reaction chamber, and a filter. 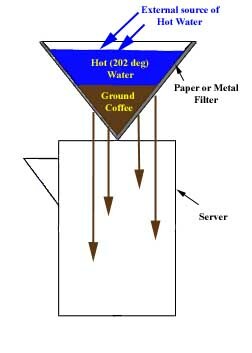 Cold water is placed in the server (lower part) and ground coffee is placed in the reaction chamber (upper part); a filter separates the two parts. The server and reaction chamber are arranged so that there is a steam-tight seal between the two. The filter is designed so that hot water can pass through it, but the mesh size prevents coffee grounds from penetrating. As the water is heated, the air trapped above the water also heats. As the air heats, it expands. Since there's nowhere for the air to go (because the neck of the upper unit extends below the water, the expansion of the air increases forces heated water to the upper chamber. (The reaction chamber is designed with a long narrow tube to ensure that it always below the water in the lower chamber. Because considerable pressure is exerted, the filter is held in place with a chain.) This continues until nearly all the water has been expelled from the lower chamber. At that time, the heated air (not steam) escapes from the lower chamber, equalizing pressure, and creating the characteristic burbling sound that tells you it's almost coffee time. The water remaining in the lower chamber continues to heat, but being heavier than the air, only a little of this water moves into the upper chamber, drawn by the escaping air. At this point, in the automatic machines, the water reaches the cutoff temperature which trips the switch and turns off the heat (or the user pulls the plug on the non-automatic ones, or takes the stovetop units off the stove). Our Very Grateful Thanks to Reader Greg For Sending This In!!! Our Very Grateful Thanks to Reader Kim For Sending This In!!! 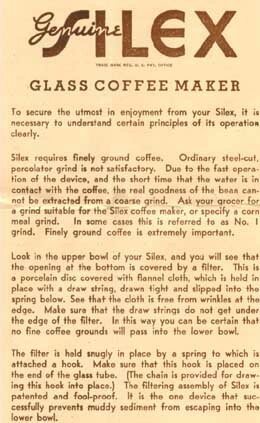 Below, you will find some pictures of a very early Silex coffee maker, including the server, reaction chamber, filter and an electric "stove" to supply heat. 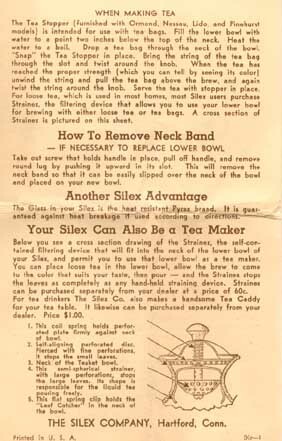 The Silex-type brewers were very elegant. 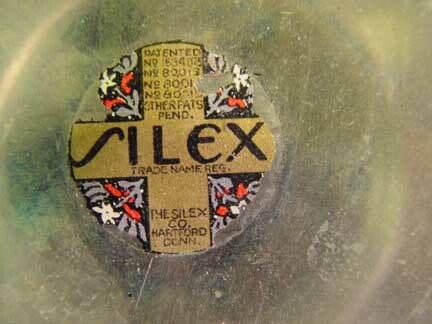 The very rare original box for Kim's Silex 4-Cup is a good case in point. The graphics are spectacular, and they appeal to a woman of culture in the Morning, in the Dorm, or in the Afternoon, as shown below. Note that the ladies are dressed in the height of fashion. We have discussed "multifunctionality" as a concept in selling items that were quite expensive in our pages on Kitchen Mixers and Vacuum Cleaners. 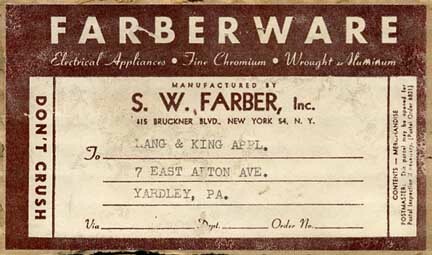 Briefly, folks in the Depression were more likely to spend money on an appliance if it did more than one thing. 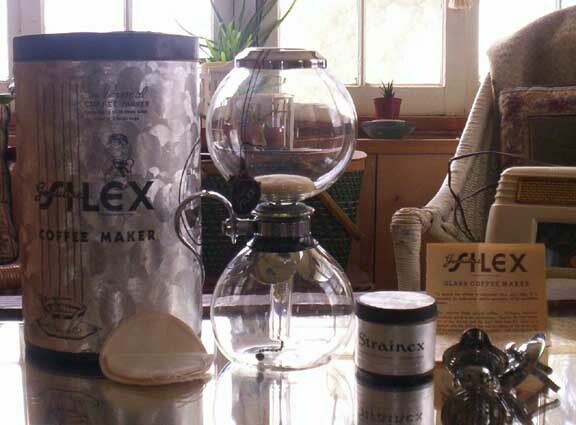 Here is multifunctionality applied to the Silex brewer -- there was a filter attachment called a "Strainex" that would allow you to brew tea in the device. During the 1970s, Saturday Night Live did a sketch about an "Mr. 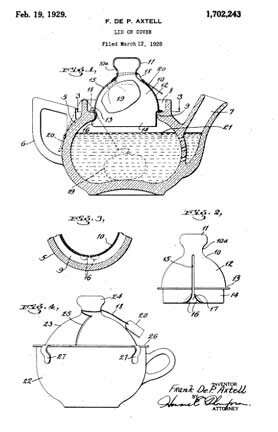 Tea" brewer; this is the same thing -- the elaborate vacuum system is replaced with an attachment to hold tea leaves and the server is simply used to boil water. The gadget has a part that works like an old-fashioned tea infuser. This is the first of these that I have ever seen! This is very good from a theoretical point of view, but the Silex presented certain operational difficulties. For example, you had to watch the thing like a hawk to remove it from the heat exactly when the water had boiled out, otherwise, you would wind up boiling the coffee that had flowed down into the server; conversely, if you took it off the burner too soon, then the brew would drain down into the remaining water and create a weak, diluted beverage. The steam seals would harden, making it difficult to separate the pieces. It is almost impossible to clean the long narrow neck of the reaction chamber. (The Fuller Brush Company used to sell a special long, thin brush just to clean vacuum coffee makers...). The filters were made of cheesecloth and had to be changed regularly. (the lady of the house was expected to sew new ones...) The stove could get very hot and, if left unattended could be a danger to children. Finally, the product can be misused -- people can put coffee in the lower part and water in the upper part leading to a disgusting mess and possibly an explosion. (This was used to comic effect in several films, particularly Woman of the Year with Katharine Hepburn and Spencer Tracy.) And, last but not least, these delicate hand-blown glass objects broke very easily. Here are some photos of a vacuum machine from Germany that has all of the above problems. Note here that the reaction chamber is held to the server by a metal "clamp". 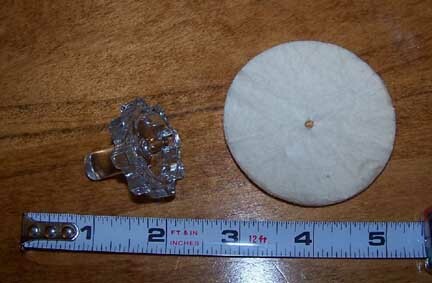 Our reader Karen sent these photos with a question of how to clean the "gunk" that had accumulated in the narrow tube. "....we purchased the denture cleaning tablets last evening and tried them out on the pot, both top and bottom (used 4 tablets in the top, same for the bottom). I'd say it removed about 98% of the "gunk" from the glass top......it didn't do anything to the stain in the metal bottom. 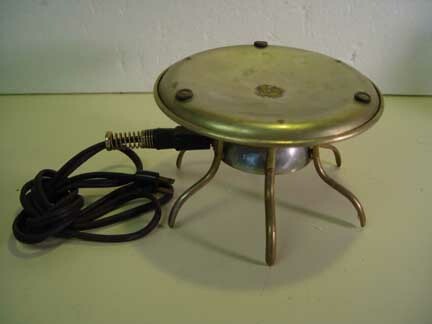 This was a very good experiment in my estimation and I am very pleased with the results...."
Briefly, Ms. Pierce's invention relies on a "push button" to engage two spring-steel contacts. 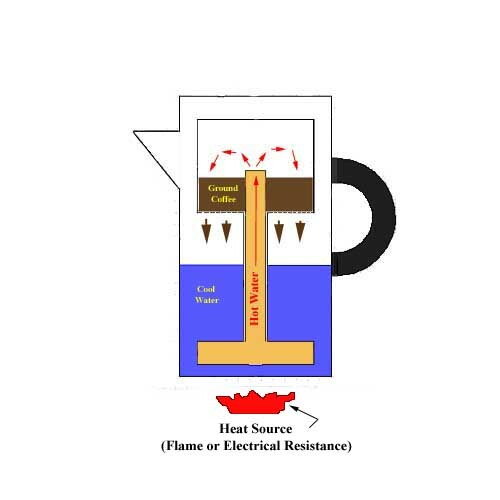 When the button is pushed in, a locking device (the "detent") holds the circuit closed and allows a heating element to get red hot. This is conveniently arranged in the "well" where the lower part of the reaction chamber is located. This conserves electricity in that it only heats the water in the place where it is going to rise into the reaction chamber. The bottom part of the server is shaped so that all the water in it will flow into the well. When all the water has been converted to steam, the temperature in the well will rise dramatically. At this point, a bimetallic strip will curl upward, trip the detent and break the circuit. Several adjustment screws are provide to control the timing of events. The bimetallic strip is made up of two metals with very different expansion properties (like copper and steel). If the one that expands rapidly is placed on the bottom, the strip will curl upwards as it is heated because the bottom part wants to expand faster than the top. 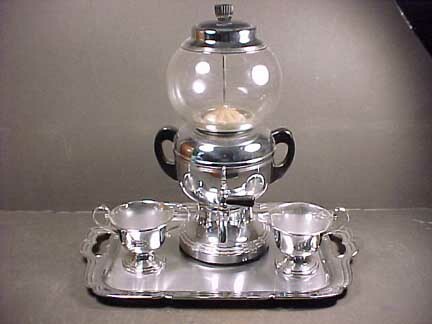 Ms. Pierce's invention is the first truly "automatic" vacuum coffee brewer, and is the basis in design for the Farber automatic "Coffee Robot." The Pierce design was a great improvement over the Silex design, but those nasty filters were still a problem. If the chain broke, there would be a mess as the filter would shoot toward the ceiling. Plus, housewives all over the country were getting sick and tired of sewing those cheesecloth covers. In addition, there was still the problem of the doofuses who put the coffe in the server instead of the reaction chamber. In that case, the coffee would swell and block the reaction chamber tube, which could lead to either an explosion or a very nasty cleanup mess. Fortunately, Ivar Jepson, Ludvig Koci, and Eric Bylund were on hand to solve these problems. They also improved the shape of the water heating zone, eliminating Pierce's "well" which had been hard to clean. (Mr. Koci is also famous for designing the astounding Sunbeam T-9 Toaster). This dynamic trio was employed by the Chicago Flexible Shaft Company which all of you antique buffs now know as the parent company of Sunbeam. 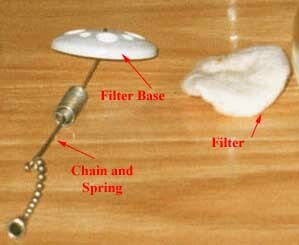 Jepson et al devised a completely new metallic filter that sent the cheesecloth filters back to Wisconsin. 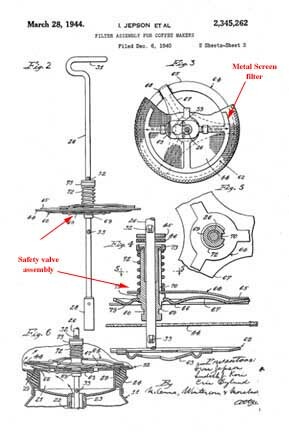 Their invention was filed on March 9, 1942 and Patent 2,345,264 was granted on March 28, 1944. They hired Alfonso Ianelli to design the exterior and the incredibly beautiful Sunbeam C-20, C30, C-40 and C-50 line was born. Since World War II was in full swing, Jepson et al. did not get to see their invention put into production for several years. 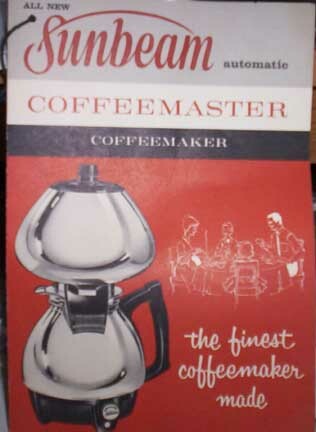 However, when consumer goods returned to America, the Jepson patent led to the most beautiful vacuum brewer ever to be made -- the Sunbeam Coffemaster. This lovely device began as Model C-20 and went through several incarnations into the 1960s, culminating in the C50. The very early models have bulbous feet that morphed into a slender, cylindrical shape. Only the C-20 used the "screw down" method to secure the filter-rod assembly since it was a bit tricky to engage. The C-30 models improved this by using a filter-rod assembly that truncates in a hook at the bottom. 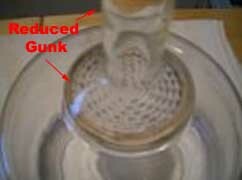 In turn, the hook catches the bottom of the reaction chamber's "tube" or funnel. This hook-style rod was retained to the end-of-run C-50's. Another "improvement" featured on the C-30's that C-20's did not have was the much needed handle (a match for the server) which allowed for better post-brew handling of the often scorchingly hot reaction chamber. 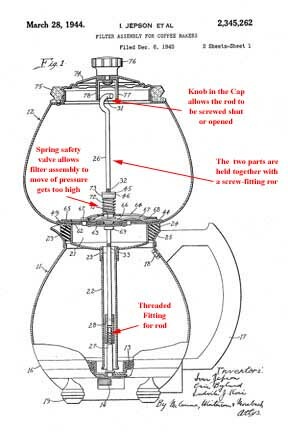 Check out our page on Coffee Paraphernalia for the actual directions for the C30. The C30A has a problem with the seal between the two parts. If yours is stuck (the pieces won't separate), click here for more advice. Over the course of the years, the design of the C30A changed incrementally (in some, the filter screws on and off). I only have one manual (see below) for one particular variant. The basic principles of the C30 reamained constant through the years, so the manual can still be helpful. 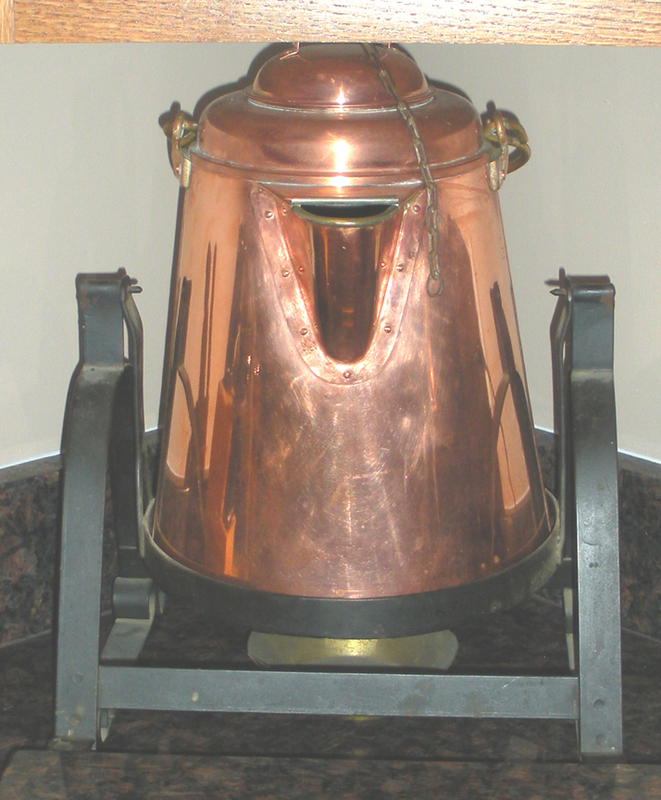 The Italians have been making a variant of the Vacuum Method brewer for some years that is called the "Vesuvio" (after Mount Vesuvius...) or the "macchinetta" (little machine.) In the US these are sometimes known as "Stovetop Espresso Makers." The container is made of heavy aluminim and is structured to operate at much higher steam pressures than the typical vacuum machine -- it even includes a safety valve to prevent explosions. In this case, the coffee is actually brewed by steam under high pressure and thus it may be technically called "espresso" (although purists would disagree vehemently, see below). The Vesuvio-type devices work fairly well and are easier to clean and operate than the vacuum machines. 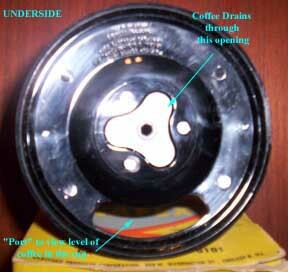 The Machinetta has a downward pointing funnel in the reservoir captured at the wide end by a doughnut shaped gasket containing a disk shaped screen. This is located at the bottom of the upper carafe unit. 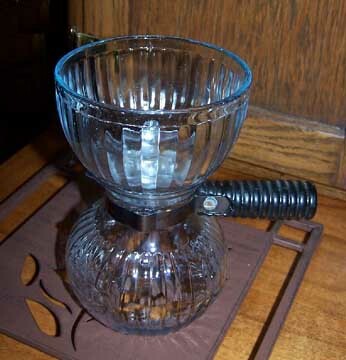 The narrow end of this lower funnel goes to within about 1/8" of an inch of the bottom of the reservoir ( like the Silex) and has a disk screen down a � " or so from the wide top to hold the coffee groundsand prevent the coffee grounds from entering the lower chamber. The coffee is wetted by the flow of hot water upward through that screen disk. 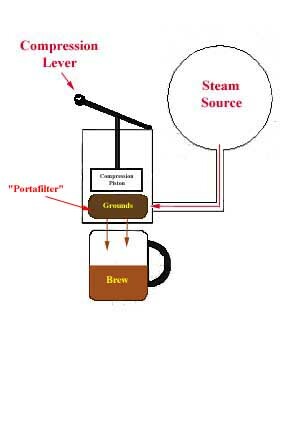 That is accomplished by pressure of boiling water steam like percolators. During the brewing flow the grounds are stopped by the doughnut shaped gasket screen in the top carafe. 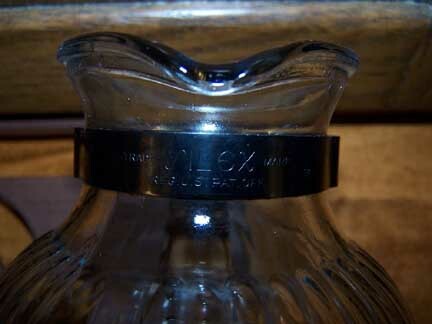 The carafe has a built in inverted funnel with a cap over it and holes in the narrow part near the top. 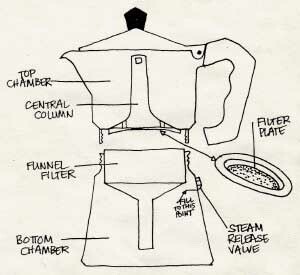 The coffee liquid then flows up through the funnel and into the upper carafe through those holes. 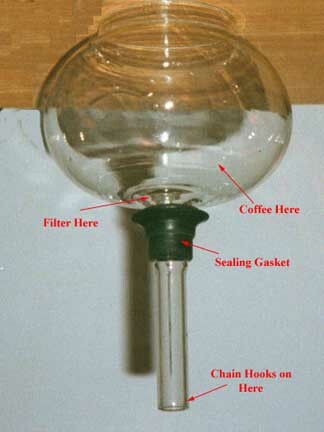 When the brew is done, the coffee liquer cannot return to the lower reservoir because the upper end of the funnel is higher than the brew surface. No valve needed! 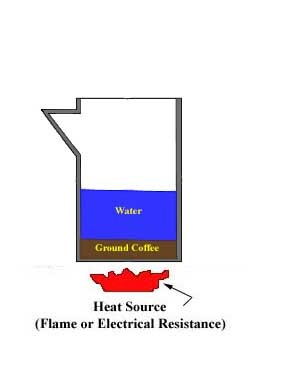 The coffee may be poured without removing the reservoir. The only thing that ever goes wrong with these devices is that the gasket between the lower and upper parts will begin to deteriorate and the thing will spew steam out the joint. This is easily fixed. 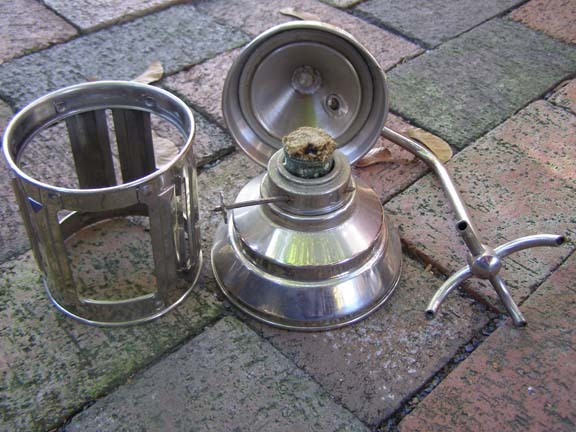 Consult HREF="http://www.espressozone.com/stovetop-espresso-maker-parts.aspx?gclid=CNeW7bfsz6MCFRE95QodL1KrwQ">Theis Site for replacement parts. 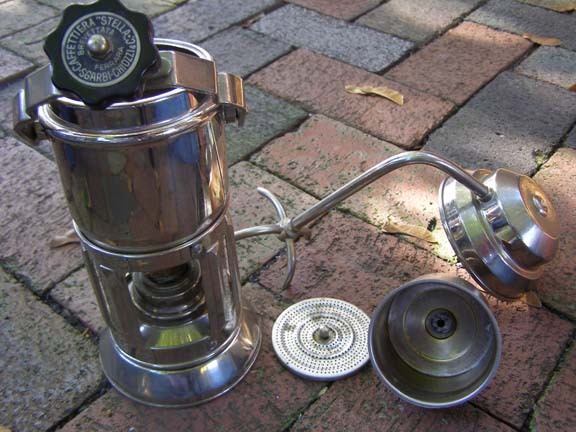 Gail, one of our readers, supplied these photos of The STAR ("stella") is an unusual coffee maker ("caffettiera") that is basically of the Vesuvio type. A Better Mousetrap, Italian Style! The threaded knob holds the pressure vessel together. Coffee is packed tightly in the basket and water is placed in the bottom. 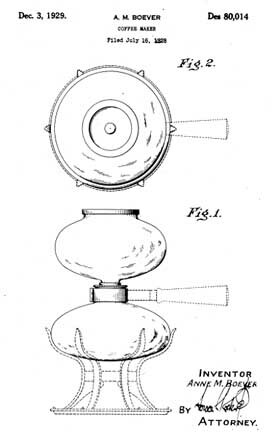 The alcohol lamp heats the water and the resultant steam forces its way upward through the coffee, simultaneously exerting pressure on the brewed liquid to drive it out the four-pronged spout. My guess is that the spout just fits into a big mug or cup, or it could be used to fill four demitasse at once. I have annotated the photos to help you. I have put this on the site as a curiosity. It seems like there are a million companies that make "Caffettiere" and each one adds some little modification to the basic design. This one looks like it was made from sheet stock and doesn't require casting or machining threads like the typical Vesuvio. Since it uses alcohol fuel, it would have been a great idea for places in Italy without regular electric or gas service. I'd say that it was designed in the 1920s, but could have been made any time up to the present. At this point, we enter a realm of technology that is sure to spark considerable debate. Espresso (or Expresso) refers to a method of making coffee that involves both Pressure and Steam. There is considerable debate about the amount of pressure and the role of the steam, but both are necessary. The principal difference between the other brews and espresso is that the water actually penetrates the coffee grains as opposed to just flowing around them. Apart from the very early inventions, espresso has never been brewed directly with steam. 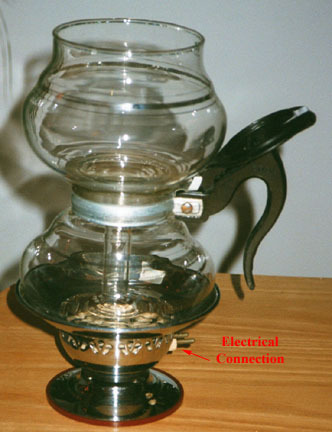 Steam pressure was used merely as the vehicle to pass the heated waterthrough the packed coffee at high pressure to extract the beverage. The finely ground coffee is packed in the portafilter and tremendous pressure (8-9 bars or 112-126 psi) is required to extract the oils etc. Steam pressure alone can't be used, since en espresso boiler can only be safely maintained at 1.2 bar (about 16 psi), so an external method of creating the pressure was needed. At the beginning of the 20th century, Luigi Bezzera invented the lever espresso machine, where a large spring, compressed by a lever could be used to create the force necessary to extract the coffee. 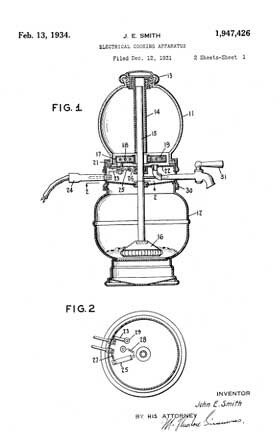 Bezzera was a poor man, and in 1905 sold the patent to Desiderio Pavoni, the first company to market the commercial spring lever espresso machine. The first espresso machine reached the USA in 1927 and was installed at Regio's Restaurant in NYC (it is still there and working...) The exertion needed to compress the spring by pulling the lever before releasing it to extract the shot, led to the term "pulling a shot" which is still common among baristas. 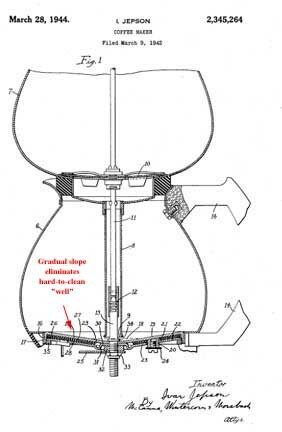 The Gaggia company perfected espresso by cooling the steam as it contacted the heavy "group" (where the portafilter is inserted holding the ground coffee). The brewing water was kept at the correct (88-92 c /201 f) temperature required for the extraction. 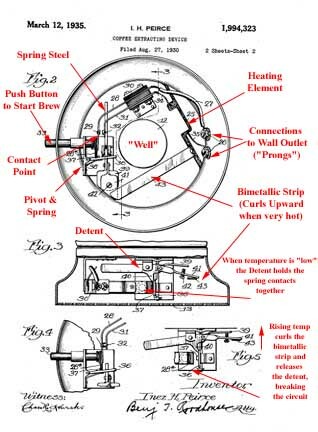 The spring lever was the dominant commercial espresso technology until the pump machine was invented in the '50's by Faema. Faema also invented the legendary E51 head (group) that was heated by boiler water circulation to maintain ideal temperature for brewing. 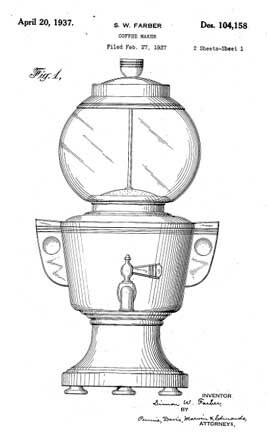 Pump machines were used to force the water through the coffee rather than the force of the lever. 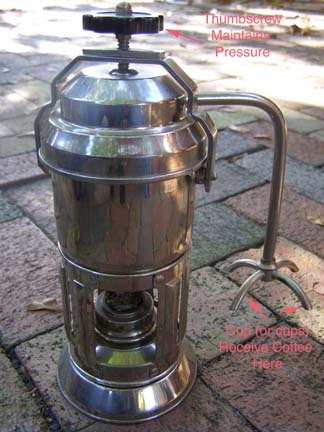 Many "home expresso" machines use pump technology. The term "espresso" has two meanings in relationship to the process. First, it means that the single serving of coffee was made solely (espressly) for the cutomer, and secondly that the coffee was squeezed out (expressed) by high pressure. However, mixed in with this is the connotation of steam trains with special schedules (as in the "Wabash Express") So, Espresso is coffee brewed with steam and pressure, made one serving at a time. Toot! Toot!